>> Submit a product enquiry. Many existing and emerging deformable mirror technologies share quite similar drive requirements. Starpoint's AmpArray™ can drive a wide range of MOEMS and small bimorph deformable mirrors, while also providing a simple system interface. This versatile device meets a broad range of user needs in a very cost-effective way. See the AmpArray Datasheet here. The AmpArray is controlled by analogue input signals. This "DAC-free" amplifier configuration is aimed at bench-top, PC-controlled lab set-ups. The all-analogue interface allows a deformable mirror to be controlled by any instrument control software that supports multi-channel DAC cards on the host platform. In many lab environments, such a DAC–HV split is the most convenient and most versatile way to offer system integration of the mirror drive function. Higher channel counts can be accomodated simply by combining several of these units together. 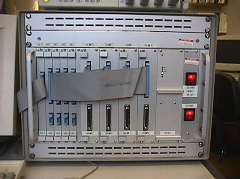 For very high channel counts, the user is directed to Starpoint's semi-custom drive solutions. Many popular continuous face-sheet deformable mirrors have very high actuator capacitance and require a higher drive current, and lower drive voltage, than the AmpArray provides. The AmpArrayLV meets the requirements of these mirrors, while retaining the simple analogue input interface of the AmpArray. See the AmpArrayLV Datasheet here. The drive amplifiers for deformable mirrors have a tough job to do. Several hundred high-voltage output signals are needed to drive the mirror's highly capacitive piezo-electric actuators. Drive currents must be high enough to assure robust performance across the operational envelope, and some mirror types need carefully designed fault-protection circuitry. Adaptive optics electronics racks are often telescope-mounted, so space constraints and power dissipation limits are tight. And, of course, proven reliability is paramount. Among the most compact form factors, and lowest power dissipations available. Case 1: The University of Durham's ELECTRA adaptive optics instrument. Case 2: The William Herschel Telescope's NAOMI adaptive optics facility. The numerous permutations of channel count, drive voltage, drive current and frequency response mean that a semi-custom drive amplifier solution is often the best way to meet an individual requirement. The table shows examples of the systems currently in service. See the detailed spec. sheet here. Pricing for semi-custom systems must include non-recurring incremental development costs. For the most price-competitive option, please examine Starpoint's standard drive amplifier products. The Quicksilver™ range of highly-integrated adaptive optics systems offer low-cost, solution-level adaptive optics products to the optical systems industry. These systems present camera-like "black-box" AO functionality to the user — the customer doesn't need specialist adaptive optics expertise to build an adaptive optics capability into a product. 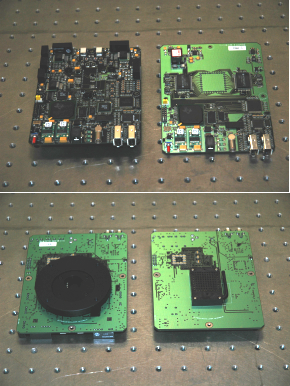 The illustration shows front and rear views of the Wavefront Sensor Module (left) and the Deformable Mirror Module (right). The Quicksilver™ devices combine MEMS deformable mirrors and ultra-sensitive electron-multiplying CCD sensors, along with fully programmable floating-point DSP capability and industry-standard IEEE1394 interfacing, in very small 112mm × 145mm board-level products. Quicksilver systems are now available in prototype form at test sites. Contact Starpoint for current status. Starpoint has substantial research and instrumentation expertise in adaptive optics, high resolution imaging, and embedded control systems (for example, see the list of research publications in these areas by Starpoint's MD Dr. Andrew Zadrozny). Starpoint can offer this expertise through consultancy contracts, especially as tie-ins with its standard product offerings. The company has been successful in winning government funding through the Smart R&D Award programme and the Office of Science and Technology's LINK collaborative R&D programme. It has carried out hardware development contracts for customers. 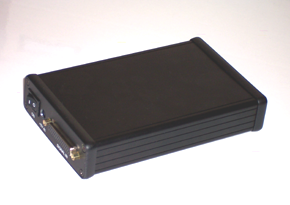 Embedded DSP hardware for imaging applications. If you have a requirement in one of these areas, Starpoint may well be able to help. Please ask.